A man of formidable administrational ability, Pickering held increasingly important posts during and after the Revolutionary War: adjutant-general and quartermaster-general of the Revolutionary Army, and, successively, Washington's Postmaster General, Secretary of War and Secretary of State. Returning to private life about 1800, he held various elective offices such as U.S. Representative and Senator intermittently until his death. TIMOTHY PICKERING. ALS. 1pp. 8" x 12 3/4". Philadelphia. July 11th 1795. 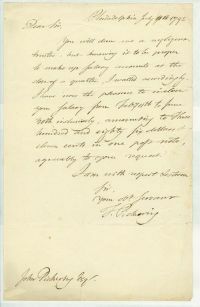 An autograph letter signed "T. Pickering" to "John Pickering": "You will deem me a negligent trustee: but knowing it to be proper to make up Salary accounts at the close of a quarter, I waited accordingly. I have now the pleasure to inclose your Salary from Feby. 11th to June 30th inclusively, amounting to Three hundred and eighty six dollars & eleven cents in one post note...". The letter is in fine condition with dark ink.